Data security is at the forefront of every business owner’s mind, whether they are a single entrepreneur, a small local business, or a billion dollar enterprise. 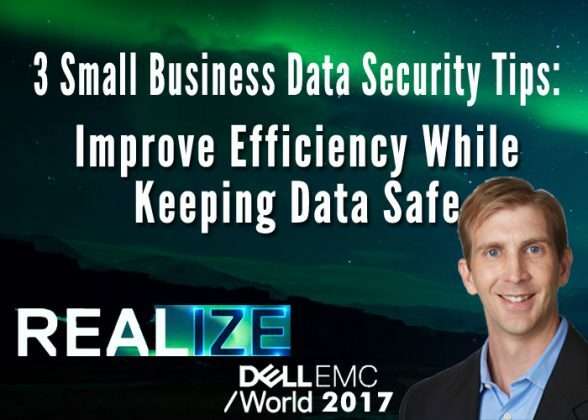 In the fifth episode of my Dell EMC World video series, I spoke with Brett Hansen, the Vice President of Dell Data Security, who shared advice and best practices for keeping your data safe. He explained that these days, transformation is the ultimate goal for businesses: how do I transform my salesforce, workforce, infrastructure, etc. to make it more modular and flexible? But all of these things impact security, and business owners worry that the changes they make to improve efficiency will inadvertently create compromises in data security. Listen in on our discussion about security and data safety by clicking play below. In addition to discussing Dell’s role in security, I asked Brett to share some tips and best practices for small business owners who wonder what they can do to be more secure. Here is his advice. “The number one thing is to be aware and be informed. That’s your starting point,” says Brett…but this must go beyond surface-level awareness. He mentions a recent study that surveyed 2,600 business professionals. Two-thirds said that they were aware of the importance of data security. However, other questions revealed that many of them were also reporting some risky behaviors, such as using public Wi-Fi. Awareness includes being conscious of our own behaviors that create risk. 3 tips for #smallbiz owners from @Dell's VP of #datasecurity for protecting their #business. Brett also warns against using signature-based anti-virus and anti-malware systems. These programs work by detecting new threats, creating a new signature to protect against that specific threat, then requiring you to update to get the new signature. These programs are large, slow down your computer, and aren’t very effective. Today there is new technology (from Dell and others) that uses machine-based learning. This tech has a higher efficacy, stops more bad guys, and has a lower impact on your device. Brett says that when we talk about controlling data leaks, we often think about networks and in points when we should be thinking about the data itself. Instead, embrace new technologies that protect data at the individual document layer, allowing you to extend your protection. Check out the video above to hear our full conversation about data security, and if you missed previous episodes in my Dell EMC World video series, hop over to catch the introduction with Erik Day, plus additional interviews with Elizabeth Gore, Bert Park, and Erik Day. There are more insightful videos to come too, so stay tuned!